iDevAffiliate is a great software tool that has, since its creation in 1999, been providing digital marketers and business owners with all of the tools they need to generate sales and cash through online marketing. With years of proven stability and thousands of happy customers, iDev affiliate has been a leading software solution in this market for a number of years. 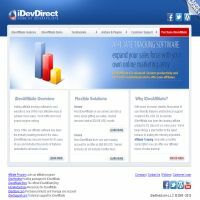 Constantly updated, the software goes the extra mile in not only providing thousands of inclusive management features that make it suitable for users of every level, but also providing tools that other services simply do not offer, including iDev’s popular affiliate training tools and videos. If you’re looking for affiliate software that gives you a little extra, iDev Affiliate could well be perfect for you. iDev Affiliate integrates easily and quickly with your existing operations, including nearly all of the shopping cart, merchant account and billing systems on the market. This means that making iDev Affiliate slot into your business is a breeze – one of the main reasons why users have consistently chosen this software to help them develop their affiliate operations. The ‘Admin Centre’ that’s built in to the software allows users to monitor performance, reports and statistics – giving them fingertip access to the most up-to-date information about their affiliate scheme (helping them to take decisions to improve performance and profitability). A wide range of advanced security features helps new and experienced affiliate managers alike, including triple redundancy protection, adjustable tracking expiration and more. All of these features come as standard and join the thousands of other features on offer with this software. As with many of the services we have reviewed in this category, iDev Affiliate software is available in either hosted or owned versions in a number of different ‘editions’ – standard, gold or platinum. Hosted editions start at just $29.99 per month and offer users many of the basic features required to set up, manage and develop an affiliate program by simply paying a monthly subscription. One of the key advantages of hosted solutions is that all upgrades and maintenance work (including installation and calibration) is included in your monthly fee, meaning iDev Affiliate provides new users with a ‘plug and go’ solution. Alternatively, owned solutions offer a little more developmental flexibility and range in cost from a one off fee of $99.99 to $299.99 (meaning even owned solutions are incredibly affordable). In addition to the basic packages on offer, new and existing customers can purchase a number of add-ons, plugins and template packs for an additional charge. We really enjoyed checking out what was on offer at iDev Affiliate and feel that many of our readers would find its features useful when setting up and managing a fledgling affiliate program. With a range of useful features, an easy to use interface and management system and a number of customer and technical support tools (including extensive user FAQs) we’re sure you’ll find everything you need to set up a new affiliate scheme at iDev Affiliate.